Welcome to another edition of Constellation Friday! Today, in honor of the late and great Tammy Plotner, we take a look at “the Dolphin” – the Delphinus constellation. Enjoy! One of these is the northern constellation of Delphinus, which translates to “the Dolphin” in Latin. This constellation is located close to the celestial equator and is bordered by Vulpecula, Sagitta, Aquila, Aquarius, Equuleus, and Pegasus. Today, Delphinus is one of the 88 modern constellations recognized by the International Astronomical Union (IAU). According to classical Greek mythology, Delphinus represented a Dolphin. Once you “see” Delphinus, it is not hard to picture a small dolphin leaping from the waters of the Milky Way. According to Greek legend, Poseidon wanted to marry Amphitrite, a Nereid – or sea nymph. However, she hid from him. Poseidon sent out searchers, one of whom was named Delphinus. Can you guess who found Amphitrite and talked her into marrying? You got it. In gratitude, Poseidon placed Delphinus’ image among the stars. Not a bad call since the Nereids were known to live in the silvery caves of the deep and the silvery Milky Way is so nearby! In the other version of the myth, it was Apollo – the god of poetry and music – who placed the dolphin among the constellations for saving the life of Arion, a famed poet and musician. Arion was born on the island of Lesbos and his skill with the lyre made him famous in the 7th century BC. The small constellation of Delphinus was one of the original 48 constellations complied by Ptolemy in the Almagest in the 2nd century CE. In Chinese astronomy, the stars of Delphinus are located within the Black Tortoise of the North (Bei Fang Xuán Wu) – one of the four symbols associated with the Chinese constellations. Delphinus was also recognized by some cultures in Polynesia – particularly the people of Pukapuka and the Tuamotu Islands. Located very near the celestial equator, this kite-like asterism is comprised of 5 main stars and contains 19 stellar members with Bayer/Flamsteed designations. It’s primary star, Alpha Delphini (aka. Sualocin), is a multiple star system located 240 light years from Earth which consists of an aging subgiant of 2.82 Solar masses, and a companion that cannot be discerned because it is too close to its primary and too faint. Next is Beta Delphini (aka. Rotanev), a pair of stars located approximately 101 light years from Earth. This system is comprised of a F5 III class blue-white giant and a F5 IV blue-white subgiant. If you don’t think astronomers have a sense of humor, then you better think again! Sualocin and Rotanev were both named by Italian astronomer Nicolaus Cacciatore, who simply spelled the Latin form of name (Nicolaus Venator) backwards as a practical joke! Epsilon Delphini (aka. Deneb Dulfim) is a spectral class B6 III blue-white giant star located about 358 light years from Earth. It’s traditional name comes from the Arabic ðanab ad-dulf?n, meaning “tail of the Dolphin”. Then there’s Rho Aquilae (aka. Tso Ke), a main sequence A2V white dwarf that is 154 light years distant. The star’s traditional name means “the left flag” in Mandarin, which refers to an asterism formed by Rho Aquilae and several stars in the constellation Sagittarius. Delphinus is also home to numerous Deep Sky Objects, like the relatively large globular cluster NGC 6934. Located near Epsilon Delphini, this cluster is roughly 50,000 light years from Earth and was discovered by William Herschel on September 24th, 1785. Another globular cluster, known as NGC 7006, can be found near Gamma Delphini, roughly 137,000 light-years from Earth. Delphinus is also home to the small planetary nebulas of NGC 6891 and NGC 6905 (the “Blue Flash Nebula”). Whereas the former is located near Rho Aquilae about 7,200 light years from Earth, the more notable Blue Flash Nebula (named because of its blue coloring) is located between 5,545 and 7,500 light-years from Earth. Delphinus is bordered by the constellations of Vulpecula, Sagitta, Aquila, Aquarius, Equuleus and Pegasus. It is visible to all viewers at latitudes between +90° and -70° and is best seen at culmination during the month of September. Are you ready to start exploring Delphinus with binoculars? Then we’ll star with Alpha Delphini, whose name is Sualocin. Sualocin has seven components: A and G, a physical binary, and B, C, D, E, and F, which are optical and have no physical association with A and G. The primary is another rapid rotator star, whipping around at about 160 kilometers per second at its equator – or about 70 times faster than our Sun. What it’s classification is, is confusing as well. It might a hydrogen-fusing main sequence star, and it subgiant that might just be starting to evolve. Wherever Suolocin lay in the scheme of things, there’s no use trying to resolve out the companion star, because it’s only a fraction of a second of arc away. However, Alpha’s nearby star, still makes for an interesting binocular view! Now let’s look at Beta Delphini. Are you still ready for a smile? Good old Cacciatore wasn’t done yet. Beta’s name is Rotanev, which is a reversal of his Latinized family name, Venator. Here again we have a multiple star system. Rotanev has five components. Stars A and B are are a true physical binary star, while the others are simply optical companions. This time it’s cool to get out the telescope and split them! Beta Delphini is a fine target for testing quality optics. At 97 light years from Earth, Rotanev’s components are only separated by about one stellar magnitude and 0.65 seconds of arc. By the way, in case you were wondering…. Nicolaus Venator was the assistant of the one and only Giuseppe Piazzi! Are you ready for a look at Gamma Delphini? It’s the Y shape on the map. Here we have a binary star very worthy of even a small telescope. Located about a 101 light-years away from Earth, Gamma is one of the best known double stars in the night sky. The primary is a yellow-white dwarf star, a the secondary is an orange subgiant star. Both are separated by about one stellar magnitude and a very comfortable 9.2 seconds of arc apart. Regardless of their spectral class, take a look at how differently their colors appear in the telescope. While Gamma 1 (to the west) should by all rights be white, it often appears pale yellow orange, while Gamma 2 can appear yellow, green, or blue. Before we put our binoculars away, let’s have a look at Delta Delphini – the figure “8” on our chart. Delta has no given name, but it has a partner. That’s right, it’s also a binary star. Its identical members are too close together to see separately and only by studying them spectroscopically were astronomers able to detect their 40.58 day orbital period. Although Delta is officially classed as a type A (A7) giant star, it has a very strange low stellar temperature and an even stranger metal abundance. So what’s going on here? Chances are the Delta pair are really class F subgiants that have just ended core hydrogen fusion and both slightly variable. Do they orbit close to one another? You bet. So close, in fact, there orbit is only about the same distance as Mercury is from our Sun! Now let’s take out the telescopes and have a look at NGC 7006 (RA 21h 1m 29.4 Dec +16 11′ 14.4) just a few arc minutes due east of Gamma. At magnitude 10, this small and powerful globular cluster might be mistaken for a stellar point in small telescopes at low power, for a very good reason… it’s very, very far away. It is thought to be about 125 thousand light years from the galaxy’s core and over 135 thousand light years from us – far, far beyond the galaxy’s halo where it belongs. Even though it is a Class 1 globular, the most star dense in the Shapely?Sawyer classification system, and many observers comment that it looks more planetary nebula than it does a globular cluster! Try NGC 6934 instead (RA 20 : 34.2 Dec +07 : 24) . This 50,000 light year distant globular cluster is much brighter and larger, though at Class VIII it doesn’t even come close to having as much stellar concentration. Discovered by Sir William Herschel on September 24, 1785, you’ll enjoy this one just for the rich star field that accompanies it. For larger telescope, you’ll enjoy the resolution and the study in contrasts between these two pairs. If you’d like a real, big, telescope galaxy challenge, try galaxy group NGC 6927, NGC 6928 and NGC 6930. The brightest is NGC 6928 at magnitude 13.5, (RA 20h 32m 51.0s Dec: +09°55’49”). None of them will be easy… But what challenge is? Welcome back to Constellation Friday! Today, in honor of the late and great Tammy Plotner, we will be dealing with the “little dog” – the Canis Minor constellation! One of these constellations was Canis Minor, a small constellation in the northern hemisphere. As a relatively dim collection of stars, it contains only two particularly bright stars and only faint Deep Sky Objects. Today, it is one of the 88 constellations recognized by the International Astronomical Union, and is bordered by the Monoceros, Gemini, Cancer and Hydra constellation. Like most asterisms named by the Greeks and Romans, the first recorded mention of this constellation goes back to ancient Mesopotamia. Specifically, Canis Minor’s brightest stars – Procyon and Gomeisa – were mentioned in the Three Stars Each tablets (ca. 1100 BCE), where they were referred to as MASH.TAB.BA (or “twins”). In the later texts that belong to the MUL.APIN, the constellation was given the name DAR.LUGAL (“the star which stands behind it”) and represented a rooster. 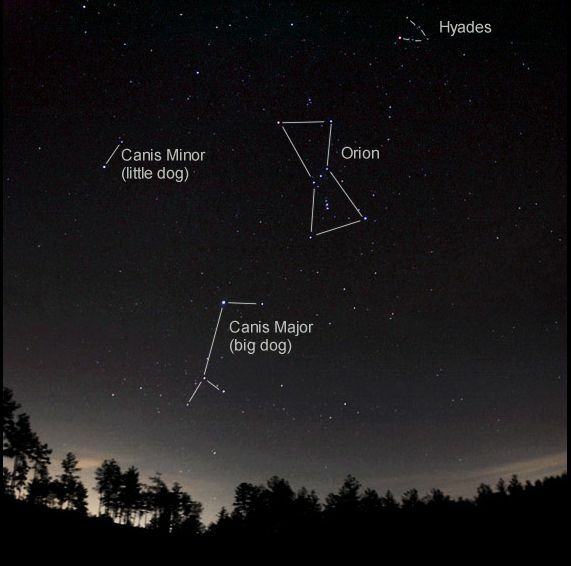 According to ancient Greco-Roman mythology, Canis Minor represented the smaller of Orion’s two hunting dogs, though they did not recognize it as its own constellation. “Canis Minor is usually identified as one of the dogs of Orion. But in a famous legend from Attica (the area around Athens), recounted by the mythographer Hyginus, the constellation represents Maera, dog of Icarius, the man whom the god Dionysus first taught to make wine. When Icarius gave his wine to some shepherds for tasting, they rapidly became drunk. Suspecting that Icarius had poisoned them, they killed him. Maera the dog ran howling to Icarius’s daughter Erigone, caught hold of her dress with his teeth and led her to her father’s body. Both Erigone and the dog took their own lives where Icarius lay. To the ancient Egyptians, this constellation represented Anubis, the jackal god. To the ancient Aztecs, the stars of Canis Minor were incorporated along with stars from Orion and Gemini into as asterism known as “Water”, which was associated with the day. Procyon was also significant in the cultural traditions of the Polynesians, the Maori people of New Zealand, and the Aborigines of Australia. In Chinese astronomy, the stars corresponding to Canis Minor were part of the The Vermilion Bird of the South. Along with stars from Cancer and Gemini, they formed the asterisms known as the Northern and Southern River, as well as the asterism Shuiwei (“water level”), which represented an official who managed floodwaters or a marker of the water level. 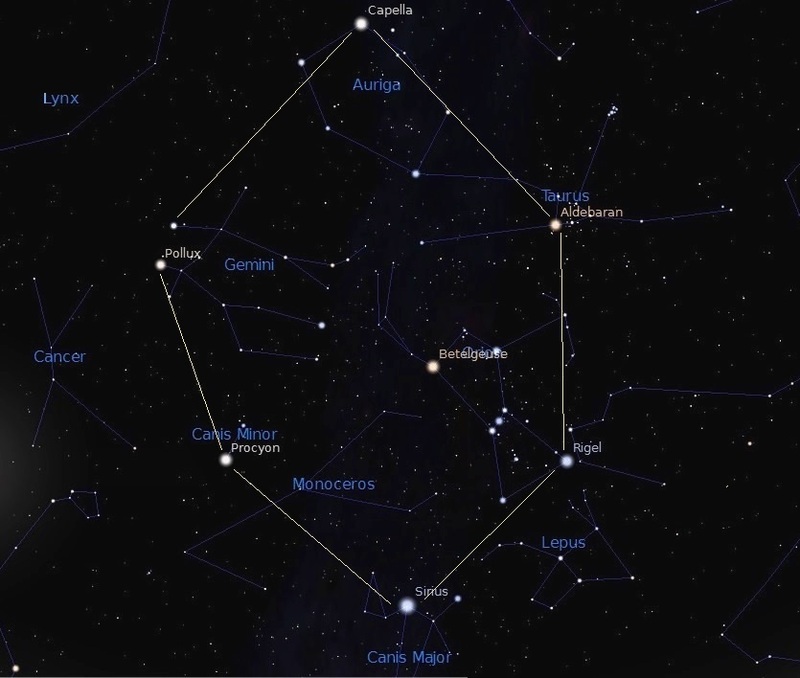 Canis Minor was one of the original 48 constellations included by Ptolemy in his the Almagest. Though not recognized as its own asterism by the Ancient Greeks, it was added by the Romans as the smaller of Orion’s hunting dogs. Thanks to Ptolemy’s inclusion of it in his 2nd century treatise, it would go on to become part of astrological and astronomical traditions for a thousand years to come. For medieval Arabic astronomers, Canis Minor continued to be depicted as a dog, and was known as “al-Kalb al-Asghar“. It was included in the Book of Fixed Stars by Abd al-Rahman al-Sufi, who assigned a canine figure to his stellar diagram. Procyon and Gomeisa were also named for their proximity to Sirius; Procyon being named the “Syrian Sirius (“ash-Shi’ra ash-Shamiya“) and Gomeisa the “Sirius with bleary eyes” (“ash-Shira al-Ghamisa“). 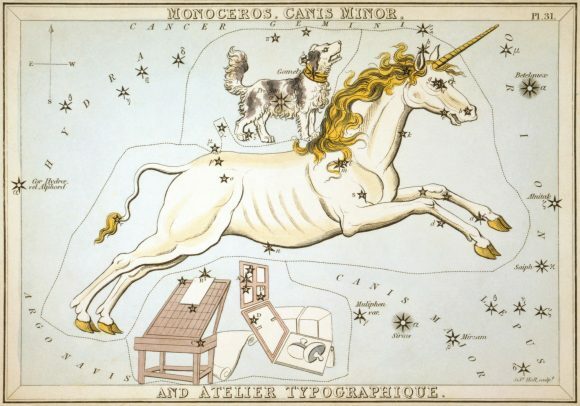 The constellation was included in Syndey Hall’s Urania’s Mirror (1825) alongside Monoceros and the now obsolete constellation Atelier Typographique. Many alternate names were suggested between the 17th and 19th centuries in an attempt to simplify celestial charts. However, Canis Minor has endured; and in 1922, it became one the 88 modern constellations to be recognized by the IAU. Canis Minor contains two primary stars and 14 Bayer/Flamsteed designated stars. It’s brightest star, Procyon (Alpha Canis Minoris), is also the seventh brightest star in the sky. With an apparent visual magnitude of 0.34, Procyon is not extraordinarily bright in itself. But it’s proximity to the Sun – 11.41 light years from Earth – ensures that it appears bright in the night sky. The star’s name is derived from the Greek word which means “before the dog”, a reference to the fact that it appears to rise before Sirius (the “Dog Star”) when observed from northern latitudes. Procyon is a binary star system, composed of a white main sequence star (Procyon A) and Procyon B, a DA-type faint white dwarf as the companion. 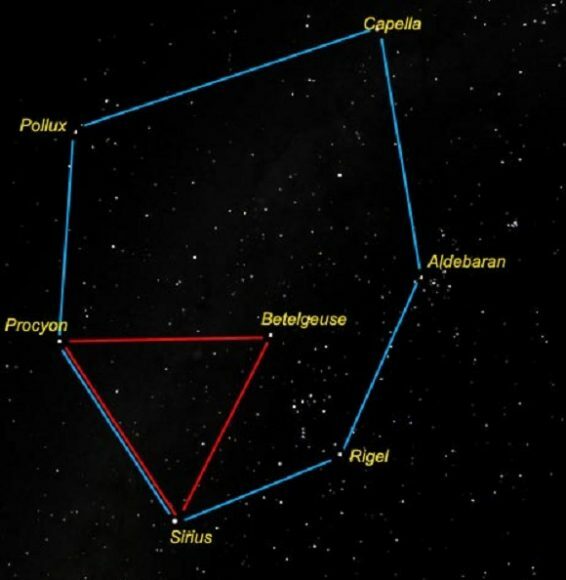 Procyon is part of the Winter Triangle asterism, along with Sirius in Canis Major and Betelgeuse in the constellation Orion. It is also part of the Winter Hexagon, along with the stars Capella in Auriga, Aldebaran in Taurus, Castor and Pollux in Gemini, Rigel in Orion and Sirius in Canis Major. Next up is Gomeisa, the second brightest star in Canis Minor. This hot, B8-type main sequence star is classified as a Gamma Cassiopeiae variable, which means that it rotates rapidly and exhibits irregular variations in luminosity because of the outflow of matter. Gomeisa is approximately 170 light years from Earth and the name is derived from the Arabic “al-ghumaisa” (“the bleary-eyed woman”). Canis Minor also has a number of Deep Sky Objects located within it, but all are very faint and difficult to observe. The brightest is the spiral galaxy NGC 2485 (apparent magnitude of 12.4), which is located 3.5 degrees northeast of Procyon. There is one meteor shower associated with this constellation, which are the Canis-Minorids. Though it is relatively faint, Canis Minor and its stars can be viewed using binoculars. Start with the brightest, Procyon – aka. Alpha Canis Minoris (Alpha CMi). If you’re unsure of which bright star is, you’ll find it in the center of the diamond shape grouping in the southwest area. Known to the ancients as Procyon – “The Little Dog Star” – it’s the seventh brightest star in the night sky and the 13th nearest to our solar system. For over 100 years, astronomers have known this brilliant star had a companion. Being 15,000 times fainter than the parent star, Procyon B is an example of a white dwarf whose diameter is only about twice that of Earth. But its density exceeds two tons per cubic inch! (Or, a third of a metric ton per cubic centimeter). While only very large telescopes can resolve this second closest of the white dwarf stars, even the moonlight can’t dim its beauty. Now hop over to Beta CMi. Known by the very strange name of Gomeisa (“bleary-eyed woman”), it refers to the weeping sister left behind when Sirius and Canopus ran to the south to save their lives. Located about 170 light years away from our Solar System, Beta is a blue-white class B main sequence dwarf star with around 3 times the mass of our Sun and a stellar luminosity over 250 times that of Sol. Now hop over to Gamma Canis Minoris, an orange K-type giant with an apparent magnitude of +4.33. It is a spectroscopic binary, has an unresolved companion which has an orbital period of 389 days, and is approximately 398 light years from Earth. And next is Epsilon Canis Minoris, a yellow G-type bright giant (apparent magnitude of +4.99) which is approximately 990 light years from Earth. For smaller telescopes, the double star Struve 1149 is a lovely sight, consisting of a yellow primary star and a faintly blue companion. For larger telescopes and GoTo telescopes, try NGC 2485 (RA 07 56.7 Dec +07 29), a magnitude 13 spiral galaxy that has a small, round glow, sharp edges and a very bright, stellar nucleus. If you want one that’s even more challenging, try NGC 2508 (RA 08 02 0 Dec +08 34). Canis Minor lies in the second quadrant of the northern hemisphere (NQ2) and can be seen at latitudes between +90° and -75°. The neighboring constellations are Cancer, Gemini, Hydra, and Monoceros, and it is best visible during the month of March. The first person to ever write an article for Universe Today (apart from me) was Tammy Plotner. Tammy was an experienced amateur astronomer, and had already dedicated her life to sharing her love of the night sky with the public. She spoke at astronomy clubs, did plenty of sidewalk astronomy, and in 2004, she contributed her first article to Universe Today. By 2006, Tammy had written dozens of articles for Universe Today, and embarked on a weekly astronomy series called What’s Up This Week. We later turned those into actual books (printed on paper, no less), and did another edition in 2007. In 2015, Tammy passed away after a long struggle with MS, and we mentioned it here on Universe Today. One of my favorite projects that Tammy ever embarked on for Universe Today was to publish a guide to every single Messier Object, and every single Constellation in the sky. There are more than 100 Messier Objects, and 88 recognized constellations, and Tammy wrote an in-depth guide to each and every one. To honor Tammy, we’ve decided to bring these wonderful guides back to the surface – you probably never even realized they were in the vast Universe Today archives. The Guide to Space Curator, Matt Williams, will be completely revised Tammy’s guides, adding plenty of new pictures and links to additional resources. We’ll release one a week from both collections until they’re all republished, starting with M1: the Crab Nebula, today. I hope you enjoy them, I sure did. For those of us interested in the night sky, what could be better than having an astronomer for a friend? Well, how about if that astronomer friend has written a book detailing everything you can see in the night sky for every night of the year? Universe Today’s very own Tammy Plotner has written that book, and it’s called “Night Sky Companion 2012.” Inside, you’ll find information on meteor showers, planetary alignments, lunar features, deep sky objects, eclipses, transits and more. Tammy has written the book in her unique conversational tone (well known to UT readers!) and provides all the information you’ll need – for those just looking up with their own eyes to those using binoculars or even larger telescopes. Tammy’s book is available on Amazon in both print ($19.99 USD) and Kindle ($4.99) formats. “Night Sky Companion 2012” has nightly information for both northern and southern hemispheres, and the book provides coordinates, basic star charts and realistic illustrations to help you find what you want to see, every night of the year. Tammy is no stranger to writing books, as she has written several night sky guides over the years (see the complete list here). And of course, she is an award-winning astronomer, too! For a preview of the book, use the “Look Inside” feature on Amazon.com. Join us in congratulating Tammy on her new book!